San Jose boosters have gotten a new tool to promote business development in the area. 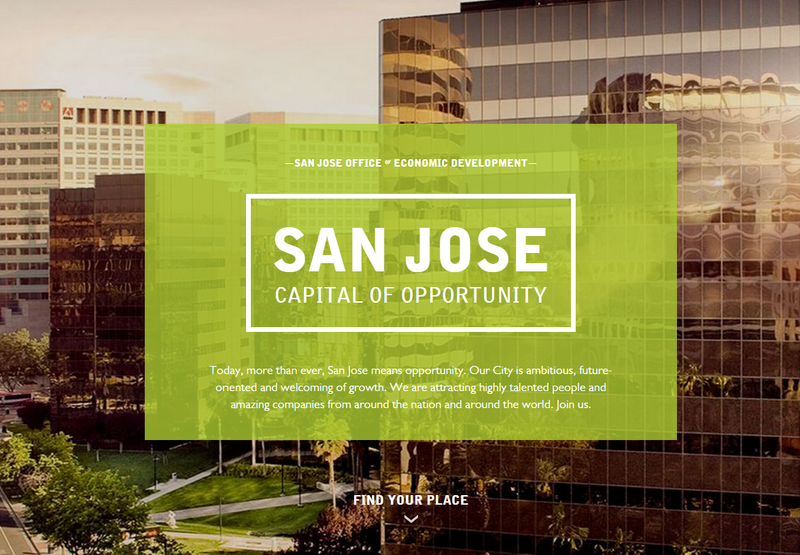 San Jose's Office of Economic Development launched a new site last month with tons of great resources and statistics. It's very well designed, mobile-friendly, and is worth checking out right over here. I hope you've noticed that we've stepped up our efforts over the last two years to produce fresh, useful communications materials that help you succeed in San Jose -- including this news brief, beautiful new online brochures, frequent news releases, and our active Twitter feed. In this issue, I am very proud to announce our new website -- SJEconomy.com. Through SJEconomy.com, you'll have easy access to information from your PC or mobile device. The new site is organized by People, Places, Business, and How We Help in San Jose. It includes maps of growth areas, a real estate locator tool, compelling facts and statistics, CEO testimonials, and photos you can download and use. There's a special section serving Brokers and Developers. You can contact the Office of Economic Development and staff easily through the About page. Please join me in thanking San Jose's amazing economic development team -- and especially the Project Lead Cara Douglas -- for creating this critical resource. I hope you enjoy previewing SJEconomy.com and use it as your "go to" San Jose business development site. Please let me know what you think, and how we can improve further by contacting Cara Douglas, Senior Business Communications Manager. My advice to City: Try to build less housing first, and the rest will take care of itself. Eh, I don't think less housing will help seeing as we have an extreme shortage of it, I'd suggest fixing the tax codes so it actually pays for the services it requires. That, or charge the Penisula cities (Mountain View, Palo Alto etc.) for the demand they're creating.